Kayakers of all ages and skill levels will be able to partake in the second annual “Paddle Battle” kayak race at Krodel Park. POINT PLEASANT — Kayakers of all ages and skill levels will have the opportunity to once again partake in a friendly “battle” for prizes when they take it to the water at Krodel Park. The second annual “Paddle Battle” kayak race, hosted by the Mason County 4-H Leaders Association, will be held on Saturday, Sept. 8, 10 a.m. at Krodel Park with registration beginning at 9 a.m. Participants have the option to pre-register at the WVU Extension Office or by calling (304) 675-0888. All are welcome to attend and concessions will be available. For those who pre-register, cost is $15 per person or $10 per person for groups of four or more. The cost for day of registration will be $20 per person or $15 per persons for groups of four or more. All participants must provide their own kayaks and their own flotation devices as well as complete a release form. Participants under 18 must be accompanied by an adult. The age groups for the event are as follows: junior, ages 8-10; teens, ages 11-16; young adult, ages 17-27; adult, ages 28-49; classic, ages 50 and older. All proceeds for the event will be going towards the completion of the 4-H dining hall at the camp in Southside. Lorrie Wright, extension agent, shared the goal for this year is to raise at least $1,000, doubling what was raised at the inaugural event. Though the campers were able to return to their camp at Southside again this year, the dining hall still needs additional work to meet fire marshal codes before the kitchen can be usable. 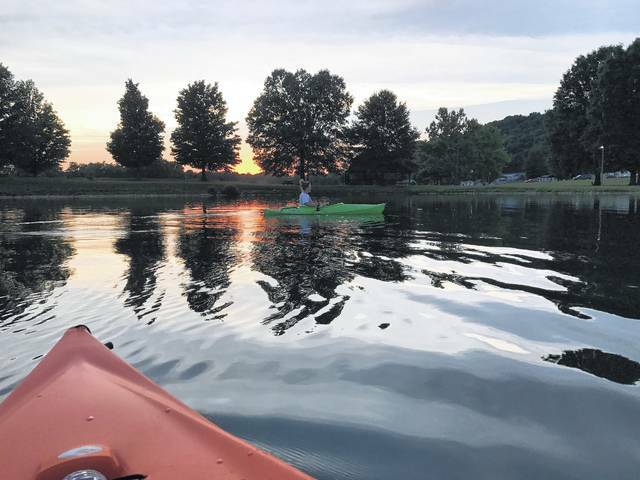 Wright shared she decided to bring a kayak race event to Point Pleasant last year because she knew of no other similar events within the county and she wanted to promote an activity the entire family could do together and have fun together. She commented though kayaking is an older known sport, it is a newer one and gaining popularity in Mason County. Wright explained how 4-H is about people working together through the various activities the organization provides and this event is a way to promote this concept, while also raising money for the dining hall. Wright commented it was decided last year by the leaders association to host the races on Krodel Park’s lake as it would make for a more family friendly environment compared to a race on the river. The lake is free of debris, no large motorized boats will be causing waves, and the area can be easily monitored by safety personnel. The City of Point Pleasant approved the use of the park at their recent council meeting. In addition, a kayaking “Quick Start” class will be offered at 8 a.m., the day of the race with a certified L1 ACA instructor. The cost is $10 per person and pre-registration is necessary. The class will touch on safety, skills, and maneuvers. Wright commented the instructor is excited to share what he has learned to all of the participating kayakers. https://www.mydailyregister.com/wp-content/uploads/sites/24/2018/08/web1_9.21-Krodel.jpgKayakers of all ages and skill levels will be able to partake in the second annual “Paddle Battle” kayak race at Krodel Park.